All transactions are safe and secure with a reliable history in online purchasing behind each of our associates. Buy the Secret Identity Superman shirt to own Superman clothing and merchandise. This ode to Clark Kent and the most ridiculous disguise in movie history (along with the fake moustache) will make you the master of disguise at your next party. 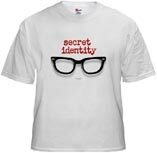 This custom Superman t-shirt lets everyone know that you're ready to reveal your secret identity. The Superman secret identity tee comes in various colors and sizes, including baby and kids. In addition to the Secret Identity Superman tee above, browse the Superman Clothing Gallery for more apparel like men's and women's clothes, kids shirts or hoodies.